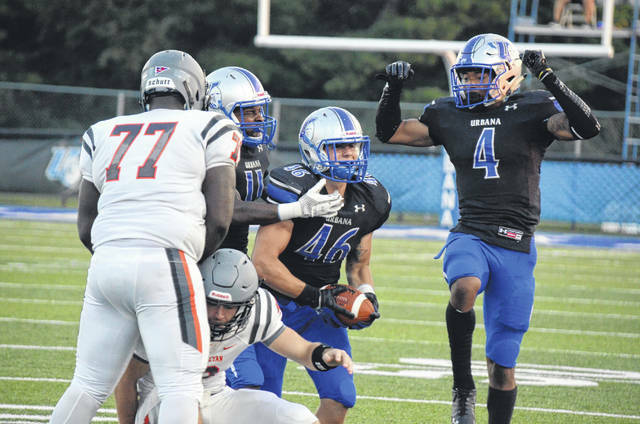 Urbana University’s L.A. Kelly (46), Tobias Hailey Jr. (11) and DeArmon Lewis (4) celebrate Kelly’s fumble recovery for the Blue Knights’ defense during the first quarter of Thursday’s contest with West Virginia Wesleyan. Urbana’s Isaiah Young (28) probes the middle for an alley to run near the goal line on Thursday. Urbana University’s Jesse Bray (6) makes a catch and stretches for yardage near the end zone while being tackled by a West Virginia Wesleyan defender on Thursday. Another Thursday under the lights at Urbana University Stadium, another win for the home football team. UU took care of business against West Virginia Wesleyan on Thursday, thumping the visitors, 42-10, in a Mountain East Conference game. The game started on a high note when UU went 69 yards for a score on its opening possession. The drive was marked by three pass receptions by Jesse Bray, including a 32-yarder, and UU scored on a 1-yard run by David Hickey. Wesleyan fumbled the ball away on its first drive, with Duray Hall forcing the ball to pop free and L.A. Kelly recovering at the Wesleyan 35-yard line. That excellent field position turned into seven points, with Justin Dennis catching a 20-yard pass from Eddie Stockett and Isaiah Young scoring from 10 yards out. UU began one more drive in the first quarter, starting backed up at its own 14-yard line with just under three minutes to play. But three passes to Chad Swanson of 23, 11 and 16 yards flipped the field and energized the UU attack. Three minutes into the second quarter, the drive ended up near where it began – in the south end zone. Young had scored his second touchdown on a 6-yard scamper. 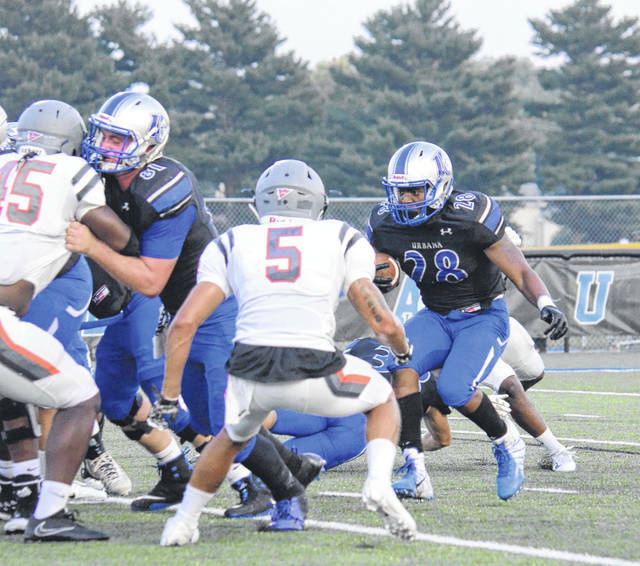 The Blue Knights were able to force another fumble later in the quarter after a short punt by Brandon Purk gave the Bobcats excellent field position inside the UU 40-yard line. Bozton Sanders knocked the ball free, with Tobias Hailey jumping on top to end the threat. The teams traded punts the rest of the way to intermission, with the home team leading 21-0. Wesleyan opened the second half with a bang, going 82 yards on the opening kick. But a holding penalty brought the ball back and a long drive stalled out at the UU 16-yard line. The Bobcats made a game of it late in the third and early in the fourth, scoring on back-to-back possessions. First, the visitors got on the board with a 38-yard touchdown from Luke Casey to Christian Nelson to make it 21-7. Later, Tyler Fischer hit a 21-yard field goal to narrow the lead to 21-10. That lead got bigger again on the next UU drive, with the Knights running the ball into position and then Zairn Davis hitting Bray for a touchdown from 19 yards away. Wesleyan drove the length of the field in an attempt to make it competitive again, but UU’s defense once again stiffened. Facing second and goal from the UU 4-yard line, the Bobcats’ Luke Casey was sacked and stripped by Mikai Toliver at the 16-yard line. Jamari Collins scooped the ball up and dashed unhindered to the other end zone, putting the nail in the coffin at 35-10 with under six minutes remaining. UU got the ball back one more time, but it ran Bailey Wallen ragged to milk the clock. Wallen toted the rock seven consecutive times for 53 yards and a touchdown, providing the Knights with their final margin of victory. For the game, Stockett – who suffered a serious injury to his throwing arm late in the first half – was 8-of-12 for 128 yards and a touchdown. Bray hauled in 4 catches for 68 yards and a score. Young had 86 yards on 19 carries. 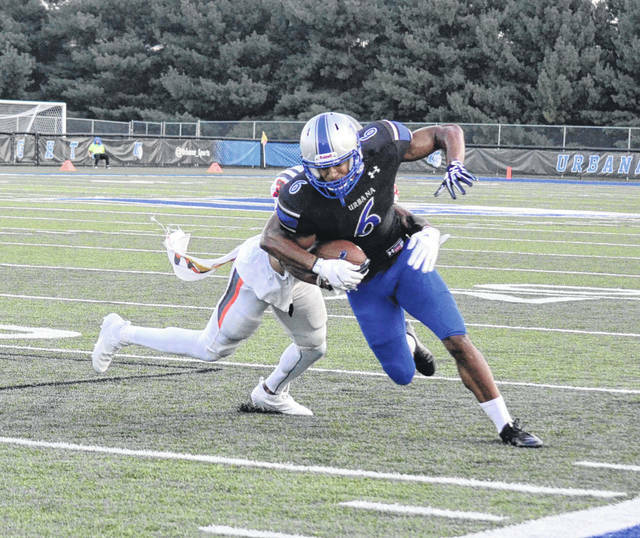 UU (3-1, 2-1 MEC) will travel to take on Charleston next Thursday, with kickoff at 7 p.m.
https://www.urbanacitizen.com/wp-content/uploads/sites/36/2018/09/web1_LAKelly_TobiasHaileyJR_DeArmonLewis092018.jpgUrbana University’s L.A. Kelly (46), Tobias Hailey Jr. (11) and DeArmon Lewis (4) celebrate Kelly’s fumble recovery for the Blue Knights’ defense during the first quarter of Thursday’s contest with West Virginia Wesleyan. https://www.urbanacitizen.com/wp-content/uploads/sites/36/2018/09/web1_IsaiahYoung092018.jpgUrbana’s Isaiah Young (28) probes the middle for an alley to run near the goal line on Thursday. https://www.urbanacitizen.com/wp-content/uploads/sites/36/2018/09/web1_JesseBray092018.jpgUrbana University’s Jesse Bray (6) makes a catch and stretches for yardage near the end zone while being tackled by a West Virginia Wesleyan defender on Thursday.